Diana Graves was an actress by profession who lived and worked in London, England. She suffered from emphysema and bronchiectasis. Both diseases were progressive and incurable, and as time passed, Diana was spending more and more time in the hospital, being treated for her chronic condition. When her health took a turn for the worse, her doctors strongly advised her to move to a milder climate. The damp and cold of London weakened her lungs and aggravated her breathing problems. For the sake of her health, she needed to relocate to a place that had a warm and dry climate. Diana, who was thirty-five years old, decided to move to Rome where the climate would be more conducive to her health. Diana’s cousin, Jenny, lived in Rome, which was an added bonus. Rome also had the Cinecittà, a large film studio that hosted international movie productions as well as television productions. It was considered to be the hub of Italian cinema. With all of her acting experience, Diana hoped to be able to work there. Life was not easy for Diana after she moved to Rome. She had some serious financial setbacks which were a cause of great anxiety to her. She also became so ill that she had to be hospitalized on numerous occasions. 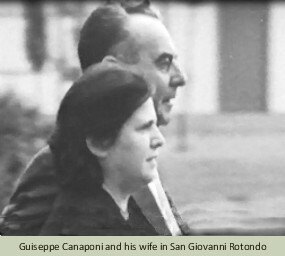 Her cousin, Jenny, suggested that they make a trip to San Giovanni Rotondo. Hopefully, they would be able to ask Padre Pio to pray for Diana’s recovery. Diana thought it was an excellent idea. After Diana had regained some of her strength, she and Jenny took a night train to Foggia and then a taxi to San Giovanni Rotondo. They arrived at the church of Our Lady of Grace just as the Mass was concluding. Diana was so weak and exhausted from the journey that she feared she might faint. She needed to get off of her feet but there wasn’t a single empty seat available in the church for her to sit in. As Padre Pio made his way toward the confessional, a large group of people crowded around him. He looked ill and he appeared to be fighting for breath in the stifling atmosphere. Diana knew that Padre Pio suffered from the same general health problems that she did. He had chronic bronchitis and asthma which often made it difficult for him to breathe. Diana was able to speak to one of the Capuchins, Father Dominic Meyer. She explained to him that she was very sick and wondered if it could be arranged for her to receive a blessing from Padre Pio. Father Dominic told Diana that there were people in the church who had been waiting weeks for the same opportunity. However, he said he would try to help. An hour later, Father Dominic motioned for Diana and Jenny to follow him. Amidst a huge crowd of people who were pushing and shoving, they were able to enter the sacristy. With great effort, Father Dominic managed to close the door. There were about twelve people in the sacristy, and many looked as though they were very ill. When Padre Pio came into the sacristy, Father Dominic whispered in his ear, pointing certain people out to him. Padre Pio would then go to the person that Father Dominic had spoken to him about, and give that person an individual blessing. When Father Dominic pointed to Diana, Padre Pio smiled at her. He put his hand on her head and spoke words which she did not understand. After Diana left San Giovanni Rotondo, she realized what a great impact the visit to Padre Pio had made on her. “It was the only time in my life that I have come in contact with a man of almost perfect goodness and spiritual strength,” she said of Padre Pio. After returning to Rome, she felt a great sense of detachment from all earthly concerns. She no longer felt like she must desperately cling to life and she was now prepared to accept death, whenever it came. Seeing Padre Pio face to face gave her the strength to do so. Nothing else seemed to matter. Diana Graves died peacefully shortly after her visit to San Giovanni Rotondo. He loved me so gently, he drew me away. Antonio Paladino of Foggia, Italy, earned his living as a day laborer. He had a serious accident on one occasion when he was hit by a car. Due to the accident, he lost most of the movement in his left foot. It became almost completely useless. He also incurred other serious injuries. Finally, he was declared totally disabled and was forced to retire from his job. Due to his disability, he received a small monthly pension. Eventually, Antonio married and had a large family. As time passed, his health began to decline. He suffered from a heart condition as well as a lung disease. He was hospitalized on many occasions. Instead of improving, he grew steadily worse. The small pension he received was not enough to support his wife and twelve children. Antonio felt a growing sense of anger and frustration regarding the many trials in his life. As a result, he lost his faith in God. His moral life deteriorated as well. He had a deep sense of guilt regarding some of his actions but he did not have the motivation to change. A number of people urged Antonio to visit the Home for the Relief of Suffering in San Giovanni Rotondo. It was considered to be one of the finest hospitals in Italy. It boasted of an impressive staff of doctors as well as state of the art medical technology. Antonio’s failing health caused him to feel desperate. He finally agreed to seek medical help in San Giovanni Rotondo. Antonio was taken to the Home for the Relief of Suffering on a stretcher on December 6, 1968. He hoped for improved health but was not confident that the doctors would be able to help him. Day after day, Antonio lay in bed, immobilized and in great pain. A cane was beside his bed but it was of no use to him. His legs were completely paralyzed. Antonio’s anger and depression over his condition was apparent to all who entered his hospital room. He used bad language while speaking to the doctors, the nurses, and even to the nuns who worked at the hospital. He did not care that his profanities offended the hospital staff. It almost seemed as if he enjoyed offending people. Padre Pio, who had passed away several months before, was also on the receiving end of Antonio’s anger. 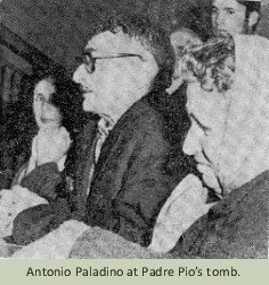 What did Antonio think of Padre Pio? He believed him to be a deceiver and a charlatan. And Padre Pio’s hospital? It had not improved Antonio’s condition in any way. As far as he was concerned, the Home for the Relief of Suffering was just another failure. He was convinced that when he was finally discharged, he would be no better off than when he had entered. One of the nuns who worked at the hospital began to pray each day to Padre Pio for Antonio’s healing. On the evening of December 12, Antonio was sleeping soundly in his hospital bed when he suddenly felt someone tapping him on the shoulder. Five times he was tapped on his shoulder. Antonio opened his eyes to find a monk standing beside his bed. “Get up and come with me,” the monk said. “But I cannot walk,” Antonio replied. “You must get up and follow me,” the monk insisted. Antonio looked over at the cane that was in his room, even though he knew it was useless to him. “You will not need that cane,” the monk said. Antonio was amazed to find that he could move his legs. He was able to get out of bed without assistance. Antonio followed behind the monk who walked up and down the hospital corridor. Antonio had been immobile for so long that he was exhausted by the brief exercise. His entire body was sweating profusely. Nevertheless, he followed the monk obediently, like a puppy dog would follow its master. Finally, they returned to Antonio’s room. The monk smiled at Antonio and said, “You have done well. Are you convinced now that you can walk just like anyone else? Tomorrow you will feel even better than you do right now. Antonio, I want you to come and visit my tomb.” Right after that, the monk vanished. Antonio then understood that his visitor had been Padre Pio. The next morning, Antonio felt a great happiness in his heart. He was simply bursting with joy. He felt renewed within and without. He realized that the constant pain that had wracked his body for many years was gone. His breathing too felt completely normal. He was certain that he no longer needed to depend on the oxygen tank that was at his bedside. When he got out of bed and walked down the hall, the hospital staff looked at him in disbelief. Antonio explained that Padre Pio had come to him in the night and had healed him. He told the details of his remarkable experience to the doctors, the nurses, and the patients. Everyone listened with great interest. For several days, Antonio did nothing but repeat his story over and over again to the many people who asked him for an explanation. Dr. Federico Ficola, who worked in the orthopedic and trauma departments at the Home for the Relief of Suffering, listened with great interest to Antonio’s story. Dr. Ficola saw the amazing change in Antonio’s condition and marveled at it. Dr. Giuseppe Gusso, the chief of staff and medical director of the Home for the Relief of Suffering, also saw the transformation in Antonio’s physical condition. Dr. Gusso noted that Antonio’s personality seemed to have undergone a complete transformation as well. Before his remarkable experience, Antonio had been openly hostile to those he came in contact with. His arrogance and sarcasm made him very unpleasant to be with. However, his anger and negativity seemed to have vanished overnight. He now interacted with people in a loving and friendly way. He had previously been a nonbeliever. He now acknowledged God sincerely, with his words and with his actions. It was obvious to everyone who spoke to him that he was a man of deep faith. He began to pray diligently for all of the patients at the Home for the Relief of Suffering. Antonio had truly been healed in body, mind, and spirit. Soon, Antonio was discharged from the Home for the Relief of Suffering. Upon leaving the hospital, he went to the monastery of Our Lady of Grace. He had an important appointment to keep. When Padre Pio had appeared to him in the hospital, he had asked him to visit his tomb. Antonio walked down to the tomb unaided. He no longer needed to use a wheelchair. He knew that he had Padre Pio to thank for that. 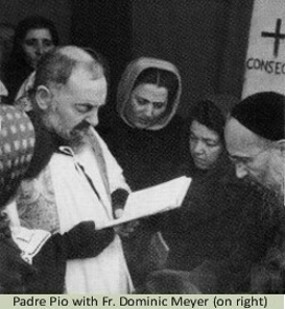 A number of people were gathered at Padre Pio’s tomb when Antonio arrived. He knelt down and prayed aloud without any shame. In a strong voice, he named the serious sins in his life, one by one. He asked God to forgive him. He was truly sorry for the many wrongs of his past. All who were at the tomb heard Antonio’s public confession and were deeply moved. Many were crying when he finished his prayer. Antonio’s family and friends had hoped that he might receive some improvement in his health at the Home for the Relief of Suffering. No one had ever imagined that he would receive so much. In 1945, thirty-four-year-old Giuseppe Canaponi, a railway worker from Sarteano, Italy was riding to work on his motorcycle when he was hit by a truck. He was hospitalized with a fractured skull as well as numerous broken bones. For a while it was touch and go, and the doctors did not know if Giuseppe would live or die. Gradually, he recovered from all of his injuries except one. His left leg, which had been broken in five places, remained completely rigid and caused him constant pain. Giuseppe had numerous surgeries on his leg as well as physical therapy, but to no avail. He had to use crutches in order to walk. His left knee too, was a problem. He was not able to bend his knee and was finally diagnosed with “fibrous ankylosis” of the knee. To add to his problems, the incisions made in his leg for the corrective surgeries, did not heal. The open and painful wounds added to his distress. Giuseppe became very depressed. It had been more than two years since the accident but his condition had not improved. He was declared permanently disabled and forced to retire from his job at the railroad. His health in general was going in a downward spiral and he feared that death was approaching. His wife’s strong faith made up for his own lack of faith. She wrote several letters to Padre Pio asking for his prayers for Giuseppe’s healing. She told Giuseppe that they should make a trip to San Giovanni Rotondo to see Padre Pio, but he was not interested. He did not think it would be beneficial. Giuseppe’s wife continued to talk to him about Padre Pio and he finally agreed to make the trip. Giuseppe and his wife took a train to Rome and then to Foggia. Giuseppe was in intense pain on the train trip. After they arrived in Foggia, Giuseppe lost his footing and took a very bad fall. He and his wife spent the night in the train station. The next morning, they took a bus to San Giovanni Rotondo. Trying to get situated in a comfortable position on the bus was next to impossible. The bus driver dropped them off almost two miles from the monastery. A single dirt road lay in front of them. They had no choice but to walk the distance. Giuseppe breathed a sigh of relief when he and his wife finally arrived at the little monastery church of Our Lady of Grace. The trip to San Giovanni Rotondo had been much more difficult that he had ever imagined. He was so exhausted from the journey that he slipped into one of the back pews and laid down. Taking a short rest in the church seemed to revive him. Inside the church of Our Lady of Grace, there were several Capuchin priests. Giuseppe wondered if one of them might be Padre Pio. One of the Capuchins was hearing confessions in a nearby confessional. The curtain of the confessional was parted slightly and when the priest raised his hand to give the penitent absolution, Giuseppe noticed that he was wearing half-gloves. “That must certainly be Padre Pio!” Giuseppe said to himself. At that very moment, Padre Pio lifted his eyes and looked straight at him. When their eyes met, Giuseppe felt as though he had been hit by a bolt of electricity. His entire body began to tremble. Giuseppe decided to wait in line to make his confession to Padre Pio. In the confessional, he did not have to worry about remembering all of the sins of his past. Padre Pio remembered them for him, down to the letter. He named them one by one, as Giuseppe listened and affirmed that what he said was true. Padre Pio was very kind and very compassionate. Giuseppe was suddenly able to see his sins for what they were – offenses against God. When Padre Pio gave him absolution, Giuseppe’s whole body began to tremble, just like it had when their eyes met for the first time. When Giuseppe left the confessional, he felt like a new person. His wife saw him walking toward her and noticed that he looked very peaceful. She suddenly realized that Giuseppe was walking without his crutches. “Giuseppe, look. You are not using your crutches and you are walking just fine!” she said. Giuseppe had not noticed it until his wife mentioned it to him. He was just as astonished as she was. Not only was he walking unaided, he was also free of pain. But there was more. His knee had lost its rigidity. He then reflected that he had been able to kneel with ease while making his confession to Padre Pio, something that had previously been impossible for him to do. At the time he was making his confession, it had not occurred to him that he was doing anything unusual. When Giuseppe returned to his hotel room, he examined his leg closely. He repeatedly knelt down on his “once immobile knee” and had no trouble doing so. In addition, the open and painful sores on his leg, which had bothered him for months, had all healed over. It was true. Giuseppe had received a miraculous healing. The next day, Giuseppe went to the monastery to thank Padre Pio. “You do not need to thank me because I did not heal you,” Padre Pio said. “It was God who healed you. All I did was pray.” When Giuseppe went back to the doctor’s office for a check-up, he was greeted with amazement by his doctor. His doctor was shocked to see the change in his condition. Giuseppe’s case was eventually studied in Rome in a special Orthopedic Congress and presented to eight hundred doctors. His instantaneous recovery defied scientific explanation. As time went by, Giuseppe made many more trips to see Padre Pio. The two became close friends. Giuseppe tried to think of different ways in which he could help the Capuchin community at Our Lady of Grace monastery. Because he had worked as an electrician for the railroad before his accident, he put his skills to good use. He thoroughly examined the wiring system at the monastery and did much repair work to the electrical outlets. Padre Pio was very happy to see the improvements he was making at the monastery. As time passed, Giuseppe became a part of the inner circle of Padre Pio’s closest friends. On one occasion, Giuseppe went to see Padre Pio on a very cold and rainy evening. Even though he was not feeling well, he decided to visit Padre Pio anyway. Due to a sore throat and laryngitis, he was not able to speak above a whisper. He was soaking wet when he walked into Padre Pio’s cell. Father Carmelo was visiting with Padre Pio at the time. Padre Pio noticed at once that Giuseppe looked ill. He asked Father Carmelo to see if he could find some warm clothes for Giuseppe to put on. Father Carmelo tried his best but could not find any. Padre Pio began to look around the room and finally found one of his large scarves. He put it around Giuseppe’s neck. At once, Giuseppe felt a wonderful warmth coursing through his entire body. “I feel better already!” he said to Padre Pio. As he spoke the words, he suddenly realized that his laryngitis was gone. Giuseppe felt such a sense of well-being that he did not want to take the scarf off. He wore it home that night and then kept it on for many days. Finally, Padre Pio told him that he could keep it. Giuseppe was very happy to be in possession of a relic of Padre Pio. Many of Padre Pio’s spiritual children had a desire for such a relic, but very few were able to obtain one. One day, Padre Pio lost his handkerchief and was looking everywhere for it. Giuseppe had a handkerchief with him and offered it to Padre Pio. Padre Pio took it and put it inside his habit, over his heart wound. He always kept a cloth over the wound to absorb the blood. Later, Padre Pio returned Giuseppe’s handkerchief to him. Even though it had been washed and ironed, there were still blood stains visible on it. On one occasion, Giuseppe felt a strong desire to pray for Padre Pio’s deceased parents, Grazio and Giuseppa Forgione. He began to pray for them faithfully every day. Later, he became busy with many other concerns, and eventually forgot to include them in his prayers. One day at the monastery, Padre Pio’s words surprised Giuseppe. “I want to thank you, Giuseppe,” Padre Pio said. “What do you want to thank me for?” Giuseppe asked. “I want to thank you for the prayers you said for my dear parents,” Padre Pio replied. Giuseppe had never mentioned to anyone that he had been praying for Grazio and Giuseppa. From his very first meeting with Padre Pio in the confessional, Giuseppe felt Padre Pio’s paternal love and care. He was like a father to Giuseppe. It was true that Padre Pio had a reputation for being stern. That was not Giuseppe’s experience. In the years that followed, Giuseppe felt continually supported by Padre Pio’s prayers. He once stated that the only time he felt truly happy was when he was with Padre Pio.